You won’t find a more enlightening — and inspirational — environment than the Virginia Museum of Fine Arts! 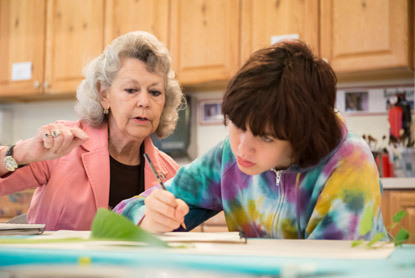 From gallery talks and tours to art classes, seminars, teacher programs, and family fun, the museum offers a variety of learning experiences for every age and every interest. 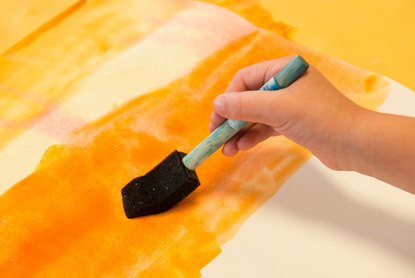 Ages 5–6 | Have a blast experimenting with colorful paints, papers, and modeling materials! Explore a range of creative, introductory activities designed to foster artistic growth, dexterity, and most importantly, imagination. 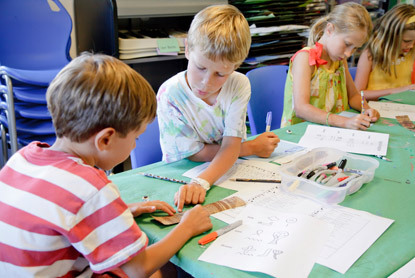 Ages 7–9 | Develop personal style, boost artistic confidence, and improve skills in drawing! Learn more about composition, lighting, and perspective, and experiment with a variety of tools and papers. 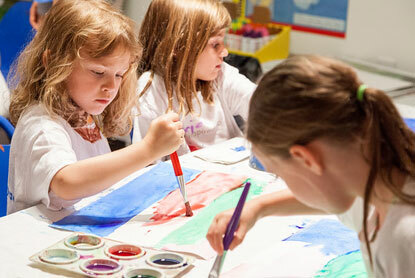 Ages 7–9 | Travel through time and around the globe, celebrating works from inspiring cultures! Learn how to build vessels in ancient Peru, paint like an Impressionist in France, or make jeweled treasures in Russia that are fit for royalty. 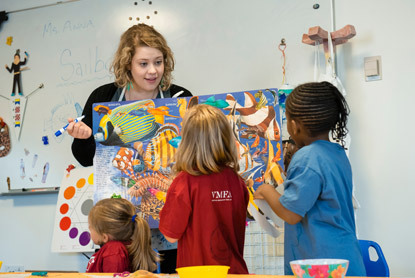 Ages 10–12 | Appreciate artistic styles from Impressionism to Expressionism! Use a range of mediums and techniques to create stylized still lifes, picturesque landscapes, and abstract images. 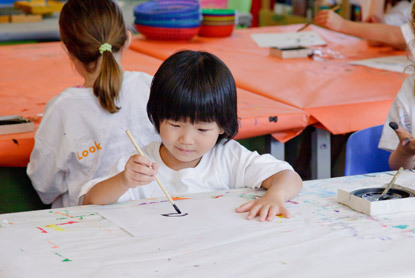 Ages 5–6 | This camp put the "fun" in fundamentals of paintings! Find inspiration from famous artists and play around with new techniques using different paintings mediums like acrylics, watercolor, and inks. Ages 10–12 | Learn all about architectural marvels throughout history! Plan, design, and construct unique structures with reusable and recyclable materials. Students are encouraged to consider green and sustainable architectural practices. Safety glasses and gloves will be provided, but students are welcome to bring their own. Ages 5–6 | Did you say animals in a museum?! Discover the habitats of the creatures you find in the galleries, and draw, paint, and model animal art of your own. 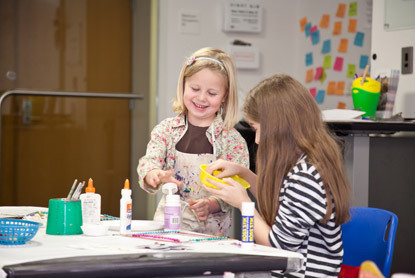 Ages 7–9 | Learn and grow while participating in fun and innovative painting techniques, inspired by 20th century art. Achieve different colors, textures, and effects in finished works, from still life to abstract painting. Ages 10–12 | Draw, paint, felt, print, and sculpt-choose one work of art each day to explore and re-create using a different medium. Discover both how the medium influences your interpretation of the art and the obstacles and rewards of creating. 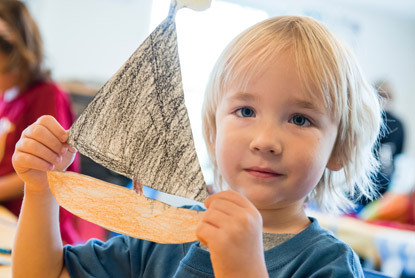 Ages 5–6 | Learn to use lines, shapes, and textures to illustrate objects from observation and imagination, building confidence, creativity, and skill in the process. Ages 7–9 | Explore architectural design and engineering with an emphasis on dome construction. Inspired by past and present structures, work on dome creations—both in collaboration with peers and on your own—using a variety of interesting materials. 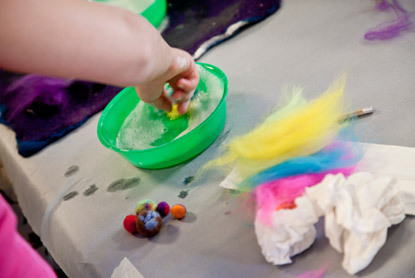 Ages 5–6 | Engage in multi-sensory art activities using sight, sound, smell, and touch. 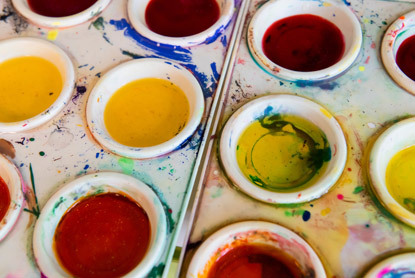 Paint to music, play your own instruments, and match scents to colors and colors to moods. 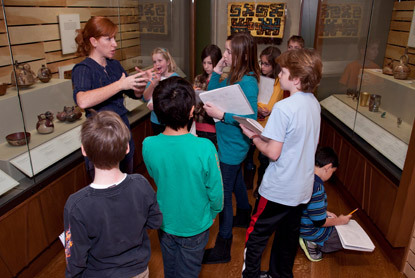 Ages 7–9 | Experience the wonders of the ancient world. Inspired by Olympic sports, royal emperors, and the everyday life of early civilizations, make clay vessels, royal attire, and more. Ages 10–12 | Discover the history and visual language of manga in this introductory camp.Through art talks, tutorials, and drawing exercises, learn the specific techniques that define this popular Japanese comic art. Ages 7–9 | See how famous artists depict their furry friends! Try your hand at painting portraits of animals and people, focusing on proportion, composition, and your subjects’ wonderfully unique features. Ages 10–12 | Unite art and science! Using professional tools and techniques, learn the significance and aesthetics of botanical illustration by observing and illustrating specimens from different plant families. 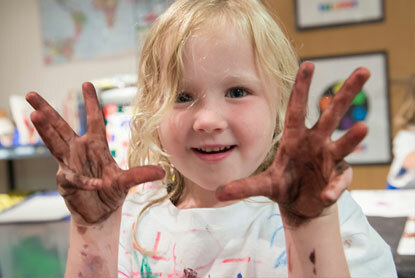 Ages 5–6 | Mix movement and art making to discover new artistic possibilities! Engage in activities that get you moving and grooving, then try your hand at upbeat projects like mobile construction and action painting. Ages 7–9 | Imagine yourself as ancient deity! Learn about the goddesses and gods of the ancient world as we think deeply about the importance of mythology then and now in the 21st century. 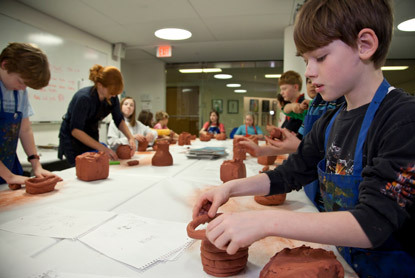 Ages 10–12 | Fascinated by sculpture, building, or simply using your imagination? Learn about three-dimensional objects and the fundamental principles of sculpting. You’ll be amazed by your own creations! Ages 5–6 | While exploring a new storybook and artistic style each day, gather inspiration from talented authors and illustrators like Eric Carle, Dr.Seuss, and James Dean. Make colorful collages, creative characters, and much more! Ages 10–12 | Improve your skill and technique in drawing while building artistic confidence and style. From creative still lifes to experimental drawing applications, arrange interesting compositions, illustrate perspective, and apply tonal value using a variety of media. Ages 5–6 | Draw as you go! 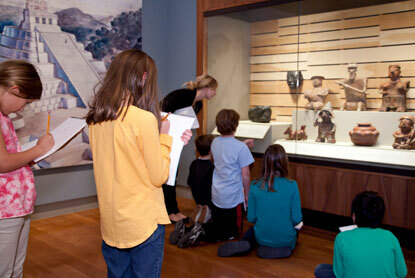 Practice observational drawing and interpretation of artworks throughout the museum. Portable materials and inspirational masterpieces will develop a passion for art and visual interpretation. 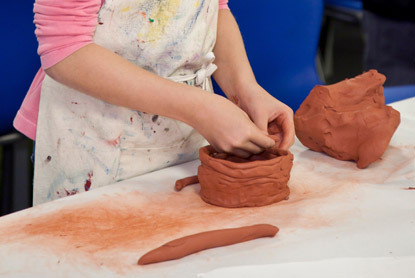 Ages 7–9 | Transform your artistic ideas into unique sculptures and designs. With planning and preparation, build objects using recycled material and plaster. Finish them with colorful paints and patterns. 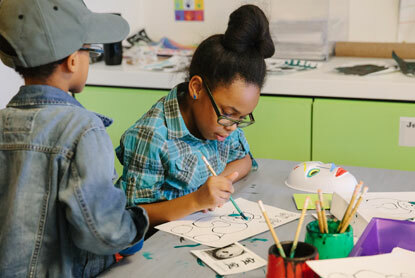 Ages 10–12 | Explore the world of design . . . unplugged! 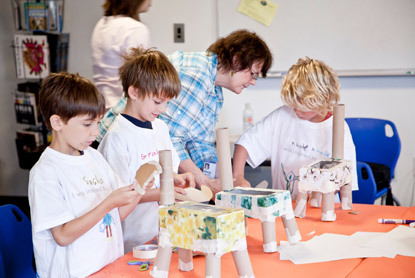 Learn hands-on design processes along with a blend of art materials to develop design thinking. Working together, create multimedia solutions to design challenges. Ages 7–9 | Discover lines, shapes, and textures in works by master artists throughout the museum while drawing from observation. With helpful tips and techniques, gain valuable confidence and skill in your drawing abilities. 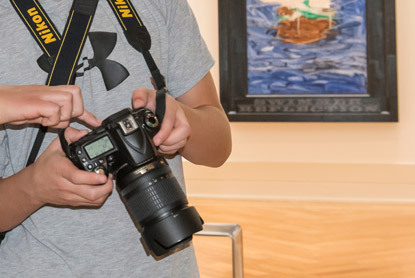 Ages 10–12 | Learn the basics of digital photography—from camera settings to photo editing—and develop a series of photographs that express the world you see. Students are encouraged (but not required) to bring their own flash drive and DSLR camera. Ages 5–6 | Where art meets archaeology–unearth a trove of ancient and unique treasures within the museum’s collections, while gathering inspiration to make your own priceless art objects and artifacts. 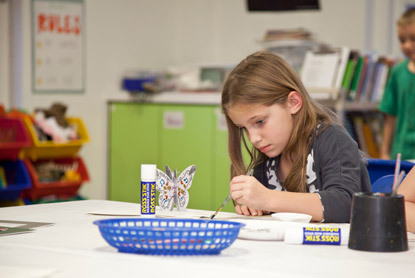 Ages 7–9 | Experiment with nontraditional processes in mixed media, drawing, and painting. 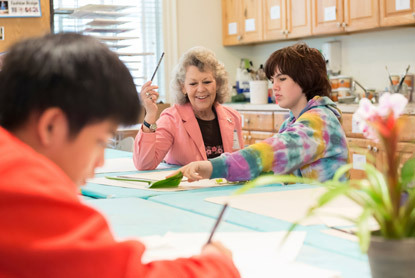 Activities include gesture drawings, abstract renderings, and altering books to create explorative art. This camp is extra messy; students are encouraged to wear old clothes! 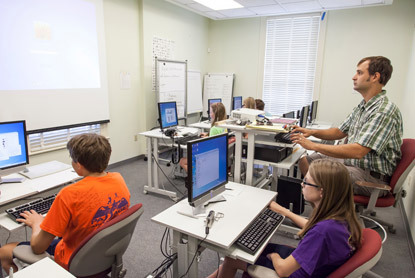 Ages 10–12 | With a blend of fine art and graphic design, learn the basics of professional design applications such as Adobe Photoshop, and use these skills to create your own photo mash-ups, GIFs, and imaginary worlds. Students are encouraged (but not required) to bring their own flash drives. Ages 10–12 | Go beyond your artistic limits and experiment with nontraditional applications of drawing, painting, and mixed media. Create alter books and focus on abstraction, self-expression, and the creative process. This camp is extra messy; students are encouraged to wear old clothes! 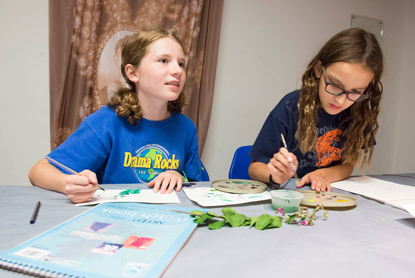 Ages 5–6 | Inspired by art movements, cultures, and natural environments, this mixed-media camp encourages creativity and self-expression through making masks, air-dry clay pots, and whimsical creatures. 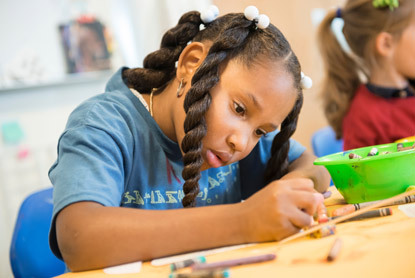 Ages 7–9 | Be amazed by the ingenuity of cultures from around the world and create works inspired by coil baskets from early America, instruments from Africa, and other fine craft objects throughout the museum. 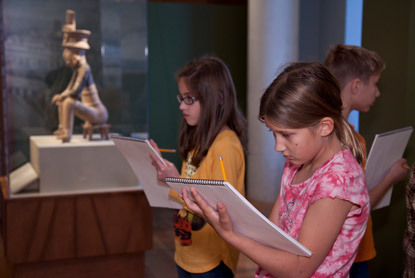 Ages 10–12 | What better place to strengthen your artistic talents than in an art museum? Young illustrators enhance their technical drawing skills and focus on principles of design while drawing from observation. Ages 5–6 | Enjoy the art of fabrics! After discovering the stunning textiles in VMFA’s galleries, explore the basics of “fabricating” your own art in the studio, including weaving, silk painting, stamping, and stenciling. 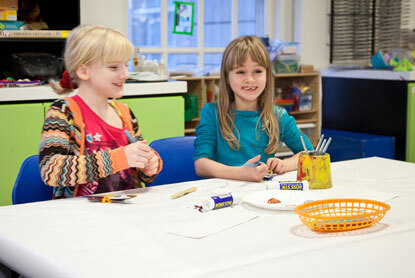 Ages 7–9 | Construct large works of art with grid techniques inspired by murals and mosaics. 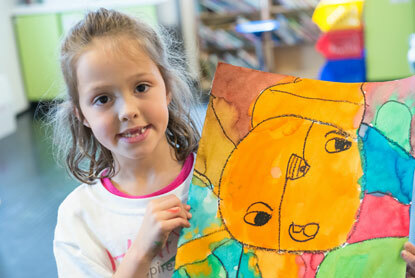 Collaborate with peers to turn small works of art into a community masterpiece. Students create a group project to display in the museum next summer and also make individual works to take home. 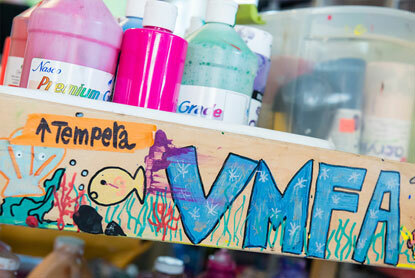 Ages 7–9 | Hand paint silk fabrics, stamp with wood blocks, and weave on handheld looms. Delve deep into textiles to learn about embellishment techniques using both silk and rayon scarves, cotton tote bags, and tee shirts. Ages 10–12 | Combine drawing, painting and recycled materials to create innovative projects using supplies such as vinyl records and bottle caps. Innovative materials and creative ideas will replace old-school techniques. 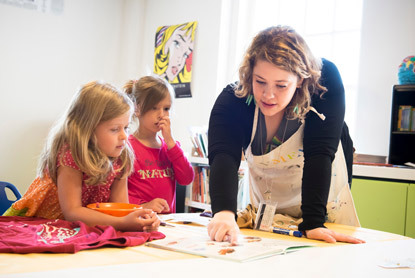 For students enrolled in both morning and afternoon youth camps, this program provides supervision during lunch as well as guided activities such as drawing in the galleries and playing games. Students are required to bring bagged lunches from home. Please avoid bringing common food allergens. 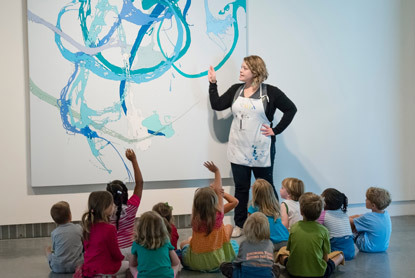 Ages K – 2 grade| Explore your senses in the studio and through the galleries! See, feel, and even hear art while exploring fun materials and projects designed specifically around each student’s needs and interests. No cancellations or reschedules within 2 weeks of camp start date!